“Why Vivian, you are being most unkind. How can you speak so cruelly of Mr. Davenport if you have yet to make his acquaintance?” Clara exclaimed archly, dabbing some more rouge onto her cheekbones and then blending it expertly into a natural flush. She looked unusually fresh this evening, which irritated her sister Vivian. Ella, the servant girl, waited until Clara was finished applying her colours, and lifted the stays over her head, gingerly trying to get them on without mussing Clara’s perfect ringlets. “Ella, stop!” Clara snapped, swatting at the girl, and connecting twice rather loudly on her arm and shoulder. She pulled on her own stays, and adjusted herself in them for a moment, slapping Ella’s hands away every time she reached out to assist. “Leave me alone, you simpleton, stop touching me. Goodness you’re more work than of help. You’re more useful doing nothing!” The servant girl frowned, and stepped away, her head hanging and her eyes glassed over. Vivian remained tightlipped and suspired through her nose, rising from the chair by the armoire, she moved in to assist her sister to slide the wooden busk into the pocket in the front of her stays. The busk was a smooth, beautifully shaped piece of chestnut, with Arthur Davenport’s name carved on it. It slid easily into the pocket between her breasts and down the center of her front—close to the heart. Such an insipid practice of carving a name in a busk was just the sort of romantic tripe Clara would lap up—proven by the five-book high stack of vapid gothic romance novels Clara kept by her bed. Vivian then brusquely tightened the laces of Clara’s corset, making her gasp out as the stays tightened around her ribs. Ella moved to the armoire to fetch the petticoat and the gown. She sported a small, satisfied smirk every time she heard Vivian rent another gasp out of her sister. “My goodness, Vivian, do you need to be so harsh?” she snapped, her blond curls bouncing, emerald eyes flashing her annoyance. Vivian just smirked to herself and gave her one more hard tug before fixing them with a knot. It was no wonder Clara always had such a buffet of devoted suitors to choose from. From the moment of her coming out, she was the prize all the gentlemen wanted. She was perfection. Her frame feminine and petite, with lovely curves and the generous swell of her breasts rose up against a fair, peachy décolletage. Her face was rosy and smooth, lips red and plump, eyes sparkling green with hair the colour of wheat, which now hung in shining coils down the sides of her face. Her voice had a girlish air, something of a vulnerability to it which seemed very attractive to the gentlemen. She sang like an angel, and played the pianoforte extremely well. Vivian took the gowns from Ella, and then kindly shooed her away with a gentle smile. She took over the task of helping Clara put on her light summer petticoat, and then over that, the wisp of a snow white muslin gown--so sheer it could have been made of dragonfly-wings. She lifted it over her head and offered her each arm of the back, which her sister carefully snaked her arms through, pulling the bodice up and adjusting it. Clara pinned the inner front of the bodice closed while Vivian slid the skirt ties through the loops at the back, and handed them to her sister from behind. Clara tightened them around the high waist, and tied them into a bow, tucking the ends into the skirts before lifting and buttoning the stomacher into place. She tugged and fluffed the long, columnar skirts, and then twisted and turned to study her figure in the long mirror. Vivian felt a momentary burn of envy. How could she be born sibling to such a golden goddess? Vivian was the opposite in every way; where Clara was rosy, Vivian was pale; where her hair was gold, Vivian’s was raven-black, where the eyes were warm summery green, Vivian’s were a cool, crisp wintry blue. Clara moved with the grace of a doe, Vivian more with the air of a predator. “I’m sure he is…” Vivian muttered, stepping back from her sister, and clasping her pale hands together in front of her stomach. Clara gave a quick appraisal of her sister’s powdery blue muslin gown and her rose-red slippers. “You look well, Vivian…” she said with little enthusiasm, seeming a bit put off by it in her tone, as if she did not wish even the smallest competition for her gentleman’s attentions. Vivian merely nodded, and waited for her sister to pass by her, the small train of her gown sliding along behind her as she left her chamber. Vivian reached to close the door behind her, giving Ella a furtive glance as she dashed through the doorway before it closed. She set the latch and then followed her sister down the stairs. Clara was radiant as the candlelight caught her glow. Vivian was but a shadow at her heels. Their mother sat with the gentleman by the hearth. He glanced up when they entered the drawing room, his dark eyes softening at the sight of the girls. Clara sank down on the sofa next to her mother, leaving no room for Vivian. She aptly maneuvered her skirts as she sat as to make it appear accidental that the hem of her sheer overdress revealed one of her teal blue slippers, and more importantly, the ankle above it. The visitor did not appear to notice her display, and neither did her mother. But Vivian did, and she could scarce keep herself from sneering at the deliberately flirtatious act. Vivian glanced at the handsome Arthur; irritated that they hadn’t even bothered to introduce him. His black eyes followed her as she moved to the window seat. She sat there while they performed their greetings, Clara feigning a girlish shyness that filled Vivian with disgust. At length, Ella appeared in the doorway in her tatty old garments; pieces once worn by Vivian’s mother years ago, shabby and unfashionable; carrying a tray of tea fixings. Vivian stood and intercepted her, relieving her of it with a thoughtful smile. “Thank you, Ella,” she said quietly. Ella’s smile to Vivian was adoring. She curtsied, glanced into the room one last time, and then slipped away. Vivian carried the tray to the round work table first, where she set it down for a moment, her back to the room. There, she could be heard turning the upside-down cups upright, and rearranging the little sandwiches and biscuits that had been jostled in transit from the kitchens. Gripping the tray afresh, she lifted it and carried it to the small table set between the gentleman’s chair and the settee upon which mother and Clara rested. “I am well, Mr. Davenport. I am pleased to meet you,” Vivian replied in a soft voice, an odd little smile upon her lips that only the visitor saw. She curtsied slowly, and then returned to the window seat, where she settled in and pulled a lace-work pillow on a spindly turned-wood stand to her knees. She began to work with it, her hands moving dexterously, the spindles clicking together as she sorted them and wound them around the bristling patch of standing pins on the pillow. A skein of lace hung from the back side, beautifully made, a piece to edge the hem of a new gown, perhaps. Mother served tea with a quiet elegance. For a moment, all that could be heard was the sound of the hot tea trickling into the fine china cups. She gave Arthur a cup first, and then poured one for herself and her golden daughter. They sipped, and the women chatted about banalities. Vivian’s hands patiently worked the spindles hanging from the lace pins. The conversation was lively for a moment, and then it fell into a lull… a few halted words here and there, and then a chilling hush followed by a ghastly sound of gagging and wheezing. Then, there was a sound of china falling to the floor, followed by two heavy thumps. 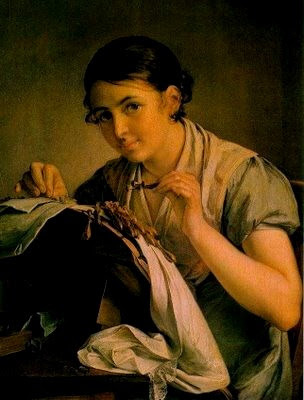 Vivian finally looked up from her lace-making. On the floor, her mother and sister lay crumpled, one draped partly over the other; her sister’s mouth pulled tight, and slathered in foamy spittle. The mother still twitched and convulsed. Arthur put his untouched cup of tea down on the tray. With a satisfied, loving smile for Vivian, he leaned back and loosened his cravat, crossing his legs elegantly. Vivian smiled warmly in return, holding his gaze with hers and sighed contentedly. And then with another sigh, she quietly returned to her lace-making, her spindles flying and clicking. Ella passed by the open door of the drawing room, and paused. A radiant grin split her face, and she walked away, humming a little song off-key. In the foyer, the great clock ticked irrevocably on. Whoa, I totally did not see where that one was going. Great story! Horrifying, but delightful.